Published: March 4, 2013 at 12:02 p.m. Updated: March 4, 2013 at 03:43 p.m. The process of building a draft board is exhaustive, with scouts and coaches picking apart game tape and workouts to determine which prospects are worthy of high grades. Although scouts are taught to base their evaluations primarily on game tape, the workouts help them discern some of the athletic traits that are difficult to glean from the film. Additionally, on-field drills allow evaluators to see how well some prospects project at different positions in the NFL. Lastly, workouts also help scouts separate prospects carrying similar grades at the same position. Decision makers will typically favor a better athlete at any position, with future development in mind. As always, please feel free to hit me up on Twitter (@BuckyBrooks) to voice your opinion on the rankings. NOTE: Original rankings from the Jan. 15 Big Board are listed parenthetically. 1) Eric Fisher, OT, Central Michigan (original ranking: 13): Fisher has quietly ascended up the charts by earning rave reviews at the Senior Bowl and NFL Scouting Combine. He is a rare athlete at left tackle, with the tools to emerge as a perennial Pro Bowler. 2) Luke Joeckel, OT, Texas A&M (1): Joeckel is as technically sound as any offensive tackle to enter the draft in recent years, but he is a notch below elite as an athlete, based on his performance at the combine. 3) Chance Warmack, OG, Alabama (5): There are plenty of scouts who believe Warmack is the best player in this draft. He is a dominant interior blocker with the capacity to overwhelm defenders with his combination of size, strength and power. 4) Jarvis Jones, OLB, Georgia (3): Concerns over Jones' spinal stenosis threaten his stock, potentially leading to a draft slot that fails to match his freakish talent and production. However, the fact that he was the most dominant defender in college football's top conference should keep Jones near the top of most draft boards. 5) Dee Milliner, CB, Alabama (7): Milliner silenced critics who questioned his top-end speed with a blazing 4.37-second 40-yard dash at the combine. Although his back-pedal still needs some work, the game tape suggests Milliner is a top-notch cover man with a polished overall game. 6) Jonathan Cooper, OG, North Carolina (11): Cooper is a freakish athlete for his size (6-foot-2 1/8, 311 pounds), and scouts are impressed with his rock-solid game. He can move defenders off the ball on power plays yet is nimble enough to lead runners around the corner on pulls. 7) Lane Johnson, OT, Oklahoma (42): Johnson has experienced a meteoric rise up the charts since the middle of last season. Not only has he displayed a refined game, he is an explosive athlete with exceptional footwork and lateral quickness. 8) Geno Smith, QB, West Virginia (14): Smith is a classic pocket passer, but a strong combine performance in Indianapolis also showcased his underrated athleticism. With times and measurements comparable to Cam Newton and Colin Kaepernick, scouts certainly will take a closer look at Smith to see if he has the capacity to execute some of the popular movement-based concepts trending in the NFL. 9) Sharrif Floyd, DT, Florida (19): Floyd has steadily climbed up the charts since scouts discovered his ability to dominate the game from inside. He finished 2012 with 13 tackles for loss and three sacks. While those numbers aren't impressive at first glance, the fact that Floyd can do it from the one- or three-technique position makes him a coveted prospect on most boards across the league. 10) Dion Jordan, OLB, Oregon (17): The Oregon product was a star in Indy, showcasing an impressive combination of speed, quickness and agility. Moreover, Jordan showed scouts he is an ideal fit as a rush linebacker in a 3-4 scheme. 11) Barkevious Mingo, OLB, LSU (6): Mingo didn't put up impressive numbers during his final season at LSU, but that won't stop scouts from salivating over his immense talent and potential following a spectacular performance at the combine. If Mingo can parlay his pure athleticism into consistent production on the field, he could become the crown jewel of the 2013 class. 12) Ezekiel "Ziggy" Ansah, DE/OLB, BYU (21): Ansah is shooting up the charts based on his strong Senior Bowl performance and impressive combine showing. The Ghana native displays freakish speed and athleticism for a 6-5, 270-pound defender. Coaches will love experimenting with his game at the next level. 13) Sheldon Richardson, DT, Missouri (12): Richardson is a disruptive interior defender with exceptional first-step quickness. He confirmed his athleticism with a strong workout in front of scouts at the combine. The film suggests he could develop into a dominant three-technique as a pro. 14) Alec Ogletree, ILB, Georgia (18): There is no disputing the notion that Ogletree is one of the most athletic defenders in the draft, but a series of off-the-field incidents has overshadowed his pro potential. While Ogletree attempted to make amends for his transgressions in interviews, the jury is still out as to whether teams will ignore the potential red flags on draft day. 15) Keenan Allen, WR, Cal (10): Allen has been out of action since a knee injury ended his 2012 campaign, but scouts still view him as one of the few No. 1 receiver candidates in the draft. If he can confirm average-to-above average speed at Cal's pro day on March 14, Allen could be the first receiver to come off the board. 16) Star Lotulelei, DT, Utah (8): A heart condition, which prevented Lotulelei from working out in front of scouts, certainly could affect his draft position, depending on further diagnosis. However, scouts will leave the medical prognosis to doctors and focus on the game tape, which suggests Lotulelei is a strong interior defender with the power to stuff running games at the point. 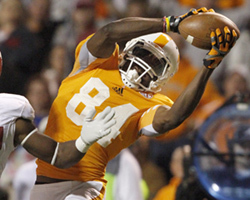 See where the top wide receivers in the 2013 NFL Draft rank on Mike Mayock's list. 17) Cordarrelle Patterson, WR, Tennessee (16): The most explosive receiver in this class remains an enigma in draft rooms based on his limited on-field résumé (only one season of major college football after two years at Hutchinson Community College). Scouts will continue to dig into the tape to determine how long it will take Patterson to refine his overall game and become an effective playmaker in the NFL. 18) Damontre Moore, DE, Texas A&M (2): Moore is on a slippery slope after turning in one of the worst performances at the combine. He pumped out just 12 reps on the bench press and ran a pedestrian (4.95 seconds) 40-yard dash. Although game tape reveals a dominant defender with an uncanny knack for creating negative plays, Moore must prove to scouts he is a better athlete than his combine numbers indicate. 19) Bjoern Werner, DE, Florida State (4): Werner's stock has taken a bit of a dip since scouts watched him work out on the turf at Lucas Oil Stadium. He is not nearly as explosive as anticipated, and his change-of-direction ability is a notch below elite. Now, that doesn't mean he isn't capable of developing into an impact defender as a pro, but scouts will need to see more from Werner at his pro day (March 19) to confirm his overall potential. 20) Tavon Austin, WR, West Virginia (27): Austin was regarded as one of the most dynamic offensive players in the draft prior to the combine; he certainly confirmed that with his impressive workout in front of scouts. Austin posted a spectacular 40-yard dash (4.34) while displaying exceptional quickness, hands and ball skills in drills. 21) Xavier Rhodes, CB, Florida State (22): It is hard to find big, athletic cornerbacks with speed in today's game. Not only does Rhodes have those traits, he is also a tenacious bump-and-run defender with the length to match up with big-bodied receivers on the perimeter. 22) Matt Barkley, USC, QB (23): Barkley didn't work out in front of the scouts in Indy but reportedly scored major points in displaying his superb football acumen in meetings. He will get a chance to build on the momentum created in meeting rooms at the USC pro day on March 27. How well he throws during his scripted workout could determine if he is the first or second quarterback off the board. 23) Tyler Eifert, TE, Notre Dame (28): Eifert is the prototypical pass-catching tight end, with a combination of size and athleticism that will give defenders problems at the next level. The Notre Dame product put on a strong performance at the combine, showcasing strong hands and surprising agility. 24) D.J. Fluker, OT, Alabama (31): Fluker is the best right tackle prospect in the 2013 class. Although traditionalists don't view the position as a premier spot, the fact that Fluker can single-handedly control the right side of the line without assistance makes him an invaluable asset in the minds of offensive coordinators. 25) Kenny Vaccaro, S, Texas (32): Vaccaro is unquestionably the most versatile safety in the draft. Last season, he routinely displayed the capacity to cover tight ends or slot receivers in space while also acting as a hard-hitting defender against the run. Although his 4.63-second 40-yard dash was a little slower than many scouts anticipated, there are few doubts about Vaccaro's potential at the next level.